The small welcoming Sirenis Hotel Club Siesta is well known for its informal and friendly atmosphere. It is situated just 10 minutes from the beach and the lively town of Santa Eulalia, where you will find a huge variety of water sports, bars, restaurants and shops. The Hotel is small and very welcoming for both families and couples. We found the hotel very clean. The food is great with a great choice at breakfast, lunch and dinner. There was always a meat and fish dish cooked to order at lunch and dinner, as well as a good choice on the buffet. The snack bar served burgers, hotdogs, pizza, toasties, salad and chips from 12pm until 5pm, so you never went hungry. The staff are a real credit to the hotel, all very courteous and helpful, nothing ever seemed a problem for them. There was usually water-polo, darts/rifle shooting and volleyball organised in the daytime. The nightime entertainment was low key which suited us very well. All in all we had a very relaxing, stress free holiday and would certainly recommend this hotel to anyone looking for the same. The hotel is at the far end of Santa Eulalia on a slight hill. There was usually water-polo, darts/rifle shooting and volleyball organised in the daytime. The night-time entertainment was low key which suited us very well. Food. Breakfast ok but evening meals rather cold and choice was very samey each day. The restarant also stank of cheese ! We found ourselves eating out in the beautiful places in town. Hotel was very clean but was let down by some dated decor and very old orange sofas dotted around everwhere ! Hotel Staff - Very friendly esp Pepe in reception and Lifeguard entertained the kids more than the First Choice reps ! I would visit this hotel again once it has been updated. A great Hotel for families as the overall emphasis is on entertainment. The Kids Club Reps were fantastic and they seem to really enjoy their jobs and bond with the children. In addition there is also plenty for the adults to do such as Water Aerobics, Archery, Jenga, Water Polo, Table Tennis, Pool etc etc All Free of charge. The Hotel food is buffet style with plenty of choice. If you have fussy little eaters you may struggle to please them. The food is of good quality but the presentation is sometimes very basic. The poolside snack bar is something I would recommend you avoid. Due to cost and quality. We visited the Titanic Bar 5 yards from the Hotel entrance. This was popular with most guests aswell. The Hotel staff are very friendly and always chatty when you are passing by. Evening entertainment was crowd participation which included Kids Disco, Magic Nights, Parrotts Shows etc. All the staff at this hotel were friendly and helpful. The breakfasts at the hotel were ok but if id stayed another week I think id have gone out for evening meals. The hotel rooms were always kept very clean as was most of the hotel however on our 2nd last night spotted dead flies/mozzies at the bottom of vinegar bottles in the dining room. Prices in the hotel bar were a bit steep as well. Id suggest if your looking for a drink before going to the resort then cross the road and go to the Titanic bar. The location of the hotel is ok. Its a downhill walk to the excellent resort and it really cant be described as steep. Its an easy walk back up with a pushchair. The pavements on the way down though are littered with dogs/cats mess so be careful. This is not the case when you cross the bridge into the resort where the area is perfectly clean. Pool area is great. Its not a big pool but never got overcrowded and the lifeguard there does a really good job. Just a few improvements to food quality and choice , the dining area and decor would make this a decent 3 star hotel. Have just returned from Siesta hotel last week, we had a great time, can't really fault it, the staff are great, the hotel was great, food was lovely lots of choice. we had no complaints, room was nice and clean, pools were lovely and not over crowded. We had a lovely crowd of people that arrived the same week as us, didn't use the kids clubs as mine are too young but the kids that did go loved it. They have a mini disco every evening which they all loved. A few shops straight opposite that sell everything. A ten minute walk to the river bridge that takes you to beach, down hill, not a struggle to get back up. All thumbs up for this hotel! We stayed at this hotel in August/September 2006. The staff were great, very friendly and very helpful. They were also great with children. The food was very good and there was lots of choice. I have read reviews by other people saying otherwise and don't know what they were complaining about and I am not easily pleased. The menu was varied and not repetitive (maybe the moaners had chips every night). The rooms were nice and were cleaned six out of seven days a week. The pools were very clean and there was a life guard (also a very friendly person). The location was good. There was a five minute walk into the town/beach and it was uphill when returning but it was not a difficult walk. There were activities and entertainment if you wanted it, we loved the daytime stuff but we went out most nights (after eating in the hotel). We have not long returned from a weeks holiday at the SIESTA and it was great. It is the first holiday I and my family have been half board, we were really impressed with the food which outshone our expectations we didn't expect there to be as much choice on offer. I went with my mum, sister and her husband also my five year old niece, my niece really enjoyed the kids club which she attended on three occasions and really enjoyed it. Everyone really enjoyed the entertainment and we found both the holiday reps and the hotel staff very friendly and helpful. I would really recommend this hotel as we were all really impressed with it and thought it was excellent value for money. The only downside to the position of the hotel I wouldn't recommend it for OAP s, even though my mum is quite active she found it a real struggle when it came to coming back from the beach or town, we had to use a taxi which are very scarce. The staff and food are excellent at this hotel. 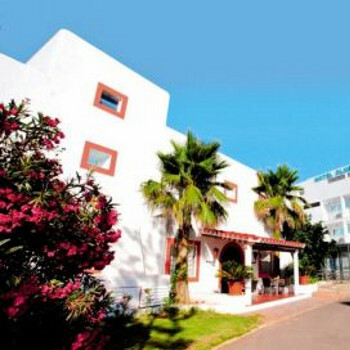 Hotel Club Siesta, Santa Eulalaia Ibiza. We have never met so many friendly people. Just come back from 1 week at the Sirenis hotel Club Siesta, travelled with 2 yr old daughter who absolutely loved the kids club. First Choice reps especially lucy (kids rep)and hannah were some of the best we have ever dealt with and the hotel staff were brilliant nothing was too much trouble and they all seemed to love kids (which helps). Hotel was very clean and towels were changed every day. Food was a bit repetative but it was the first week of the season and as were ready for coming home the menu did seem to be getting more varied. Entertainment team especially neil were brill and would often just come and join you at the bar for a chat. Location was a bit of a disappointment quite a steep hill to the beach but other than that a great week.